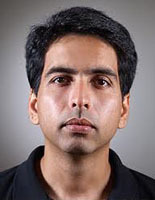 Salman Amin 'Sal' Khan is an American educator and the founder of the Khan Academy, a free online education platform and nonprofit organization. From a small office in his home, Khan has produced over 3000 videos elucidating a wide spectrum of academic subjects, mainly focusing on mathematics and the sciences. As of March 2012, the Khan Academy channel on YouTube has attracted more than 300,000 subscribers. In 2012, American magazine Time named Salman Khan in its annual list of the 100 most influential people in the world: Time 100. Khan was born in New Orleans, Louisiana. His father was from Barisal, Bangladesh. He was raised by his mother in New Orleans, where she had a series of jobs and businesses. He went to public schools, where, as he recalls, "a few classmates were fresh out of jail and others were bound for top universities". Salman Khan holds three degrees from the Massachusetts Institute of Technology: a BS in mathematics, in electrical engineering and computer science as well MS' in electrical engineering and computer science. He also holds an MBA from Harvard Business School. Salman Khan worked as a hedge fund analyst before quitting in late 2009. In late 2004, Khan began tutoring his cousin, Nadia, in mathematics over the internet using Yahoo! 's Doodle notepad. When other relatives and friends sought his tutoring, he decided it would be more practical and beneficial to distribute the tutorials on YouTube where he created an account on 16 November 2006. Their popularity on the video sharing website and the testimonials of appreciative students prompted Khan to quit his job as a hedge fund analyst in late 2009 to focus on developing his YouTube channel, 'Khan Academy', full-time. His videos attracted on average more than 20,000 hits each. Students from around the world have been attracted to Khan's concise, practical, and relaxed teaching method. With so little effort on my own part, I can empower an unlimited amount of people for all time. I can't imagine a better use of my time. Salman Khan has been featured on the The Colbert Report, PBS NewsHour, CNN, and National Public Radio. In 2009, the Khan Academy received the Microsoft Tech Award for education. In 2010, Google provided $2 million to support the creation of more courses and to enable the Khan Academy to translate its core library into the world's most widely spoken languages. In October 2010, Khan was tied for #34 in Fortune's annual "40 under 40", a list recognizing business's hottest rising stars. In March 2011, Salman Khan was invited to speak at TED by Bill Gates who claims to use the Khan Academy Exercise Software to teach his own children. In May 2011, Salman Khan appeared on The Colbert Report to talk in an interview about his teachings. He told the audience how he planned to use his software to revolutionize the field of education. Included in his interview was a montage of notable teaching moments from Khan's YouTube channel. Khan has also been interviewed by journalist Charlie Rose, and news anchor Tom Brokaw. Khan spoke at Bellarmine College Prep during TEDxSanJoseCA about the importance of education and the founding of Khan Academy. Khan is also scheduled to be the commencement speaker for Rice University's commencement exercises on May 12, 2012 as well as MIT's commencement on June 8, 2012. He lives with his wife, who is a medical specialist in rheumatology and internal medicine, and their son and daughter in Mountain View, California.